According to his book, The Science of Hitting, Ted Williams, one of the greatest hitters in the history of baseball, meticulously tested and tracked his performance. At one point, Williams broke down the strike zone into a remarkable 77 different cells the size of a baseball. In each cell he wrote his batting average. Williams figured out that by swinging only at pitches in his “happy zone”, he could bat for a .400 average (an incredible performance in the game of baseball). By testing and tracking his own performance, he learned to stop swinging at certain pitches and increased his odds of success. That’s the opposite of how most hitters play the game, and how the majority of people go through life. Most hitters – and people – react to whatever is thrown their way. Successful people, like Williams, prepare to take action on opportunity. This is done by testing and tracking what happens to you in life, and by applying the rule of cause-and-effect to everything that you do. This approach allows you to make little bets on your life where the odds are finally stacked in your favor. When you know what happens in certain circumstances, you can begin to make bigger and bigger bets because you have stacked the odds in your favor. Imagine for a moment that you were Little Red Riding Hood. Your goal was to get to Grandma’s House without running into any Big Bad Wolves. Or construction. Armed with an up-to-date GPS, you had all the knowledge you need to get to Granny’s with minimal hassle. So would you throw away the GPS and just randomly set out on any old road? Of course not! But that’s what people do every single day in their lives and businesses. They ignore the data. They ignore the instructions and roadmap to success that are right there in front of them. And so you must learn to use the data, to test and track little experiments so that you come up with a surefire path to success. That’s the scientific method to the rescue. And how you can change your life as well. You must turn your business into the world’s most important science experiment. You must aim to establish cause and effect for every aspect, including how to get more traffic, how to make more sales, and how to increase the profit you make from each sale. You need to do the same for your business. Identify where you are getting the traffic to your website or visitors to your store. Identify which referral sources send you the most sales and best prospects. You need to split test headlines on your website or newspaper ads to identify which phrases push the hot buttons of your clients and get them to take action and buy. All of these numbers are available simply by testing and tracking – either with automated software for your website or manually in your store and through your incoming phone calls. What activities done the day before allow you to have the best night’s sleep and wake up refreshed for your best day ever? What habits must you follow- and what must you avoid – first thing upon waking to get your day off to its best start? What foods can you eat for energy – and what must you avoid? Does arriving early to work ensure that your workday gets off to the right start? Is there a difference between you drinking coffee or tea or water? What happens when you give up sugar or alcohol? 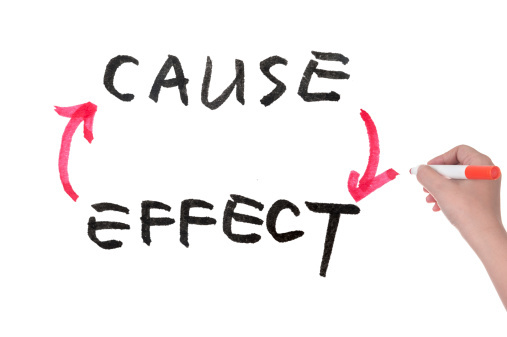 You need to establish CAUSE and EFFECT for everything in your life. Likewise, in your business you must ask similar questions that allow you to establish cause and effect for why things happen. Take a look at what every daily decision leads to in your life, and then determine if that daily decision is right for you – or does it need to change? You must test each of these variables for a few weeks at time, and do so one major test at a time. That is the scientific method. One experiment over time, repeating the scientific method every month, will bring you an incredible understanding of how to optimize your life. Life – and business – is a simple scientific combination of stimulus and adaptation. Record what happens when you add a stimulus. What happens when you remove a variable? Make the connection. Establish cause-and-effect. Track and test so that you can do better under the same circumstances next time. Monitor everything you do in your personal life. Everything you eat. Everything you drink. Everything you think, watch, read, hear, and say. Identify how you respond to specific foods and ingredients – what makes you sleepy and gives you energy…what fills you up and what makes you hungry. Identify which friends and family members leave you happy and what situations and conversations leave you exasperated. In business, monitor your traffic, your opt-ins and sales from each traffic source, your email open rates and click-through rates, and all of the data available to you. Soon you’ll notice items that stand out and make a difference, and you can focus on those strengths. Find out what works best for you and then do more of what works and less of what doesn’t! It’s that simple. Cause and effect. Stimulus and adaptation. Variable and result. Apply the scientific method to your life to get clarity for your future. No more guessing. No more painful “Groundhog Day”-like experiences of pain and suffering. Take the lessons, learn from them, make the right changes, apply the right stimulus, achieve the optimal adaptations, and come back better and stronger than ever every day. You can change. You can improve. You can succeed. You can win. You can make things better. It all starts with testing and tracking the little changes in your life that eliminate little limitations in your life and business to reveal your BIG SELF. What cause-and-effect have you established in your life that has led you to make changes?